Welcome Bingo | Play with a £30 Bingo Bonus Today! 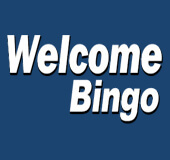 Welcome Bingo is the latest new Cassava site to rock up to the gaming arena for 2016! As the latest addition to the 888 / Dragonfish network, Welcome Bingo will welcome you to it's royal blue reels with a rockstar welcome bonus party! While you settle in and get comfy, the welcome party doesn't have to stop there, as you'll be spoilt with daily, weekly and monthly bonus and jackpot perks, plus exclusive chat game and Facebook prizes. You can then get the party started with a royal collection of bingo, slots, jackpot, scratchcard and casino bitesize treats! As soon as you enter the reels, you'll be greeted by a £10 No Deposit Required bonus, to try out some of your fave games for free! 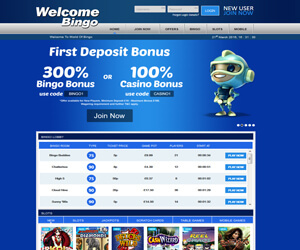 You can then receive a three stage welcome bonus party, starting with a 300% first deposit bingo bonus using the code BINGO1, or a 100% Casino Bonus using the Code CASINO1. The next one will be a 200% second deposit bonus using the code BINGO2 or a 50% casino bonus using the code CASINO2. You can then pick up a 500% third deposit bingo bonus using the code BINGO3 or a 150% casino bonus using the code CASINO3. You'll then be treated to an unstoppable stream of perks like the £5000 Jackpot Treat, Daily Login Bonus, 10% Weekly Cash Back, March Madness Redeposit Bonus Pack, the £1,000 Bingo Bonus Facebook Bonus Giveaway and more! Since you've got your bonus treats all taken care of, you can then start playing fun-packed coverall and pattern 75 Ball Bingo games, thrilling 90 ball games, plus spicy chat games! Then you can move onto the slots section to play classic and new releases like Koi Princess, Deuces Wild, Fire Queen, Las Lucas Locas, Starburst and Fruit Abduction themed scratchcards like Hollywood Stars. There's also a juicy jackpot in store for you if you play progressive jackpot games like Irish Riches, Fluffy Favorites and Piggy Payout, themed scratchcards like Hollywood Stars. You can also hit the casino table to play glamorous games like French Roulette or Cappacino Keno! You can then continue the welcome party on the go and play games on your mobile like the Enchanted Prince, Amazon Queen and Crystal Forest. Welcome Bingo accepts a wide range of safe and trusted payment methods, like Visa, Mastercard, Maestro, Entropay, and you rest assured that all your payments and winnings will be processed in a safe and secure environment!